Ormuco Stack is an intelligent multi-cloud management and edge computing platform that is built on innovative open-source tools and enables enterprises, service providers and telcos to offer public and private cloud services. It conglomerates cloud orchestration capabilities, workload automation, artificial intelligence, and machine learning with public cloud functionalities to deliver advanced software. Apart from that, Ormuco Stack is a complete solution that offers billing features, prompt support, API documentation, and feedback options to enable your organization to provide the best services and after-sales support to your clientele. In an age of digital innovation, Ormuco Stack also offers you peace of mind when it comes to data protection. It has encryption and authentication capabilities that can support multi-tenancy to ensure that your partners and customers can utilize your services assuredly. Ormuco Stack is a lightweight platform that you can utilize for your organization in 30 days or less. This means that you can gain ROI rapidly as you do not have to experience prolonged interruptions in your operations. Ormuco Stack does not break your company’s budget—in fact, it helps you regain control of your finances. That is because it is built on open-source software that does not require additional proprietary hardware. On top of that, it does not need third-party licenses to run completely. It is also automated and a fully self-service platform, which enables you to reduce overhead significantly. With Ormuco Stack, you can ease the workload of your IT team and afford them more time for critical projects. The automation capabilities of the solution enable this, so redundant or straightforward tasks are completed without human intervention. Unlike similar platforms that have per user or per unit enterprise pricing, Ormuco Stack has a single licensing model. This gives you a lower cost of investment but with access to a complete set of modern features. Ormuco Stack provides full support for multi-tenancy. This gives you the ability to offer cloud services to customers and prospective clients without incurring steep expenses. On top of that, the solution has a white labelling feature, which lets you brand the platform with your business’s identity. What Problems Will Ormuco Stack Solve? Most organizations are often limited to or prohibited from adopting public clouds due to industry regulations and data compliance issues. 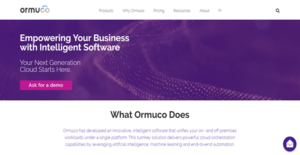 With Ormuco Stacks, you can control your budget, time, and resources again as the solution has an autonomous and turnkey platform that combines and pre-packages the latest open source innovations. Globally, the demand for cloud services is high. However, big public cloud operators cannot be present in every region. This presents an opportunity for smaller and local providers as they can offer cloud services tailored to their country’s or region’s reality and environment. That is because Ormuco’s software allows your business to deliver state-of-the-art services that can compete with major public cloud providers. Creativity and innovation should never be stopped by a lack of resources and agility on your infrastructure. With Ormuco’s software, you can deliver cloud-native applications with an outstanding user experience. If you are interested in Ormuco Stack it may also be sensible to check out other subcategories of Best Cloud Management Software listed in our base of SaaS software reviews. It is essential to keep in mind that virtually no software in the Cloud Management Software category will be an ideal solution able to fulfill all the needs of all company types, sizes and industries. It may be a good idea to read a few Ormuco Stack reviews first as specific solutions can dominate only in a very narrow set of applications or be created with a really specific type of industry in mind. Others may operate with an idea of being simple and intuitive and consequently lack complicated elements needed by more experienced users. There are also solutions that cater to a broad group of users and offer a powerful feature set, however this usually comes at a more expensive price of such a service. Ensure you're aware of your needs so that you buy a software that provides exactly the functionalities you look for. How Much Does Ormuco Stack Cost? Ormuco Stack installs on your infrastructure and is billed monthly based on the virtual resources you’ve actually consumed. It is delivered in a simplified licensing model, with features such as DBaaS, Kubernetes, or autoscaling included at no extra cost. A one-time setup fee exists and covers the installation, branding, configuration, and deployment at your location. We realize that when you make a decision to buy Cloud Management Software it’s important not only to see how experts evaluate it in their reviews, but also to find out if the real people and companies that buy it are actually satisfied with the product. That’s why we’ve created our behavior-based Customer Satisfaction Algorithm™ that gathers customer reviews, comments and Ormuco Stack reviews across a wide range of social media sites. The data is then presented in an easy to digest form showing how many people had positive and negative experience with Ormuco Stack. With that information at hand you should be equipped to make an informed buying decision that you won’t regret. What are Ormuco Stack pricing details? What integrations are available for Ormuco Stack? For more information about integrations, you can visit the website for the documentation or you can get in touch with the support team.